In ancient China, black rice (or forbidden rice) was a food reserved to Emperors. 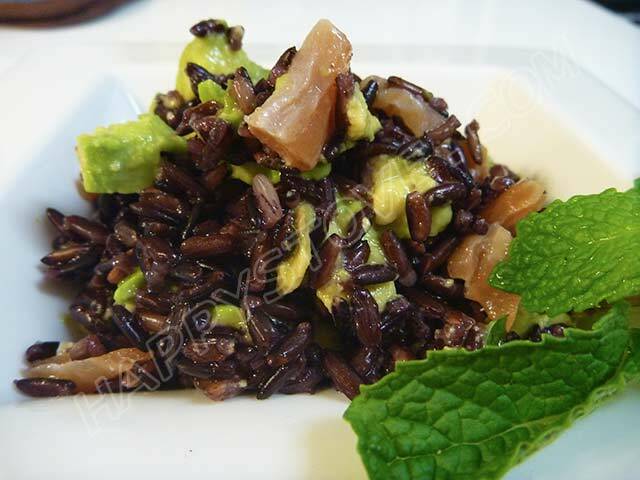 In this recipe, the nutty flavor of the black rice is combined with creamy avocados and flavored smoked salmon to prepare a yummy, healthy and delicious summer rice salad. In a large pot bring to boil 1 quart of water. Add 1/2 teaspoon of salt and the rice and boil for 35-40 minutes. In the meantime, cube the avocados and transfer them in a large bowl. Sprinkle the avocados with the juice from 2 limes to keep them from turning brown. Cut in pieces the smoked salmon and add it to the bowl together with the avocado. When the rice is fully cooked, drain it and let cool. Mix the rice with the avocados and the smoked salmon. Season with salt, extra virgin olive oil and chopped mint. Transfer in the fridge and keep cool until served. Risotto alla Parmigiana is the basic recipe for all kind of risottos. The long and complex cooking process will well reward with a delicate and delicious Italian dish. Perfect for a special candle light dinner. Asparagus Risotto is an irresistible and light vegetarian recipe for a superb dish. Perfect balance between delicacy and flavor, this risotto will charm you and your guests. Unforgettable. Oven baked red peppers stuffed with tuna, capers and rice are a perfect idea for your dinner. Awesome as main dish or as a side for your everyday meal. Strawberries Risotto is a delicious light Italian recipe that results in an original and colorful dish. This delicate vegetarian risotto is perfect for a romantic dinner with a glass of champagne.